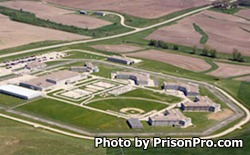 Newton Correctional Facility is located in Jasper County Iowa. It is a medium and minimum security institution that houses approximately 1,136 adult male inmates. The minimum unit is made up of the inmates who are housed at Newton Correctional Release Center, they are inmates who are preparing to be released back into society. Substance abuse treatment is available to inmates at both facilities. In addition, adult basic education and GED courses are available to all eligible inmates. Offenders can also participate in work assignments both on institutional grounds and in supervised support positions outside of the prison. Newton Correctional Facility Medium has visitation on Mondays, Fridays, Saturdays, Sundays and Holidays from 10am-7:30pm. Newton Correctional Release Center Minimum has visitation on Mondays, Tuesdays, Wednesdays, Thursdays and Fridays from 5:30pm-9pm, and on Saturdays, Sundays and Holidays from 8:15am-4pm.